When Inverness was booked I thought it was simple, put some clothes in a suitcase and go. It got to about a month beforehand and the girls started putting in the group about warm clothes and snow-boots and I realised in that moment how unprepared I was. The realisation that I was NOT a traveller hit me - I was truly clueless. What do you pack for a Winter retreat? Liquids in a hand luggage only flight? To snow-boot or not to snow-boot? WHAT DO I PACK? So I decided on no snow-boots the fashionista in me couldn't bring myself to do it. Luckily there was no snow and we could have got away with chelsea boots anyway but it was nice to have them on standby just incase. 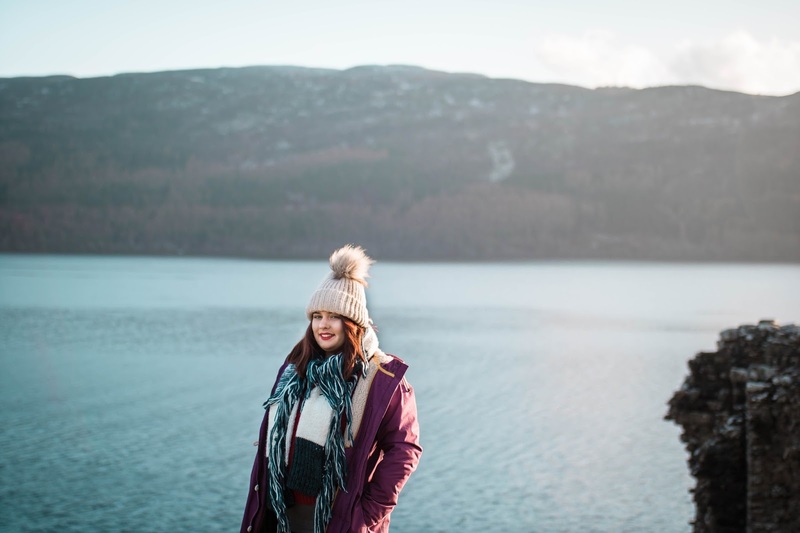 When it came to the full day, I knew we were going to be on the Loch and at the castle and knew it was going to be cold so I packed a warm outfit and it was perfect. I don't have many nice clothes as since being a Mama my fashion sense has gone from on trend to off trend and it's pretty rubbish but my kids always have lovely clothes so thats important to me. This doesn't mean I don't miss being Nicole and not just MUM. Now I am back at work and working self employed too I can start doing things this year, seeing places, holidays and getting nice clothes so what a better place to start than my Winter Scottish retreat? Here is the list below of the items I am wearing or similar if it's no longer in stock. A really warm, chunky knit hat. I chose cream because it goes with any coat or colour clothing. This was a present for Christmas and the scarf linked isn't the one i'm wearing. A big, chunky knit scarf is a must have for anyone in Autumn/Winter. This was my attempt at a festive jumper and I love it. It's so warm and I enjoy the colour of the red. I ordered a grey thermal top so I could wear it in Inverness and on the school run. Grey is nice as it goes under shirts and jumpers so easily. Some plain black, simple thermal leggings. They go under another pair of leggings so it's easy and comfortable to wear. My crushed velvet leggings are favourite, they have now gained a whole from the buckle on my shoe but I love them, theyre so comfortable and make me feel a little nicer when I'm just wearing plain black leggings. I love Jack Wills socks! I have had the same two pairs since 2012 and they last so well and they're so warm and lovely. Faux Timberlands, warm, comfortable to walk around in, okay grip and nice fur lining. 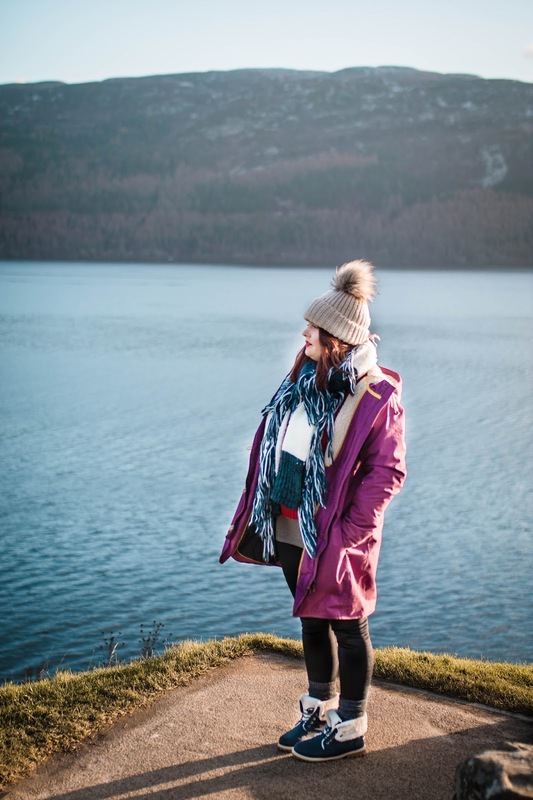 I felt like Nicole again in Inverness and really enjoyed my Winter attire. I would suggest that anyone looking at a winter UK break purchase thermals, thick socks and some boots with a good grip. I bought faux Timberlands because I knew I wouldn't wear them much but wanted to make sure that I had a good grip on the icy streets and potential snowy walks too. Our weather wasn't too bad actually so snow boots weren't needed but it's always worth packing for the unpredictable weather of the North of the UK.